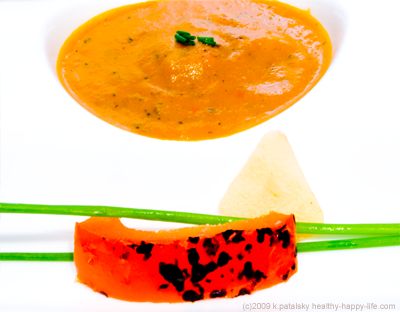 My recipe for Vegan Savory Roasted Red Pepper Soup combines the mellow, warm flavor of roasted red peppers with the bright, clean essences of parsley and tangerine. Add in a few bold shallots, heated peppers and roasted garlic and you have a pleasing savory soup that even the non-vegans can appreciate. Savory roasted pepper warmth ahead. This soup brings warm, complex tones to a meal. Serve this soup after a light citrus-mango salad. Or before a mushroom risotto or spinach-tofu lasagna. An elegant savory menu awaits. A small serving is meant to be savored. Turn gas stove on medium heat. Place red pepper directly on iron burner. Make sure the flames are not hitting pepper though. Allow to roast for about a minute on each side. Turn the pepper every few seconds for even roasting. Pepper should look black speckled, but not burnt too deep. Do this to both peppers. roast in oven on broil setting until black speckles form. Wrap whole head of garlic, or cloves in foil and heat in oven at 400 degrees for 15-20 minutes. Remove cloves by squeezing garlic, if using whole garlic head. Roughly chop bell roasted bell peppers. Chop onion. De-seed and chop jalapeno or Serrano pepper (For more heat use Serrano, or add an extra jalapeno. Add oil, onions, garlic, bay leaf, tomato and hot pepper. Add red pepper, and remaining ingredients. Cover pot and simmer for 5-10 minutes, until peppers are tender. Remove bay leaf before blending. *Warning: blending soup at a warm to high temperature can cause the blender cap to explode. Make sure your soup has cooled and that there is a small air vent at top when blending. Never blend towards your face and always start on the lowest setting. In small batches, about 1 cup each, blend the soup to a thin puree. Blend longer for a silkier puree. I recommend a well blended soup rather than a chunky blend for this recipe. Once all the soup is blended, re-pour into soup pan and allow to simmer, covered, for at least 5 minutes. Keep on low heat until it is ready to be served. Re-heating the soup removes any air bubbles you may notice right after blending. Fresh chopped green herb (cilantro, parsley or sage). Drizzle of olive or light truffle oil. heat bread, 1 tsp. olive oil and chopped garlic in oven for 10 minutes. Garnish with fresh parsley. Serve with a light green salad topped with mango and citrus flavors. Goes well with a spinach-tofu lasagna or even a mushroom risotto. Red Bell Peppers are very high in vitamin C, vitamin A and vitamin B6. One medium sized red bell pepper contains about 250% RDA of vitamin C.